Do you always need to create a chart for your data? The answer is “Not always.” You can use other devices instead, such as a gauge or scorecard. People are familiar with gauges because we use them in everyday life. You glance at your car’s gas gauge to determine how much gas you have, for example. In data visualizations, gauges are often used to monitor the status of key performance indicators or something with known data parameters. If you know the lowest and highest measurements, you can use tick marks to display them and use a pointer to show where the data is at the present time. The figure below shows examples of how gauges are used to display data. Just like pie charts, gauges have their critics. Some people believe that a gauge doesn’t provide historical data, so it’s not as useful as it could be. The same is true for scorecards. Considered to be a separate form of data visualization altogether (depending on the source), scorecards are also used to monitor measurements. As opposed to a gauge which is limited to monitoring a single measurement, a single scorecard can monitor multiple measurements at the same time which makes it more useful to some users. 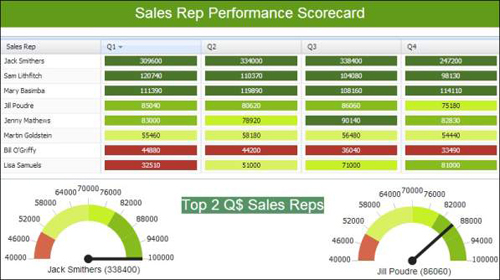 The following figure shows how a scorecard can be used to view sales data across two quarters.